Типовая точность: ± 4% or 0,6 m (2 ft) whichever is greater, NVP uncertainty is an additional error. Калибровка: User-settable NVP for twisted pair and coax. Возможность определять актуальную NVP при известной длине кабеля. Turn on the tester; then press PORT to switch to coaxial test mode. 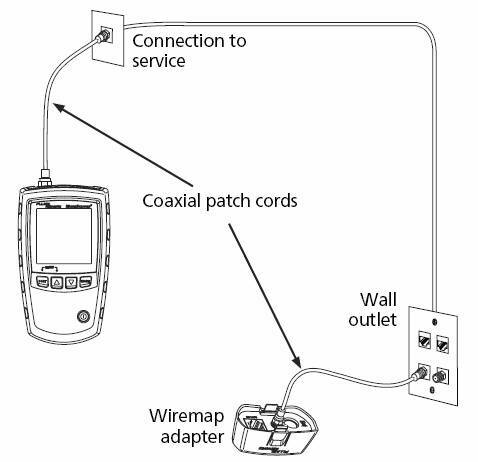 Connect the tester and wiremap adapter or ID locator to the cabling as shown in Figure 1. For cabling not terminated with an F-connector, use an adapter or hybrid patch cord to connect to the cabling. The test runs continuously until you change modes or turn the tester off. Figure 2 shows a good coaxial cable 38,4 m long and terminated with remote ID number 3. Figure 3 shows an open 12,1 m from the tester. Figure 4 shows a short 12,1 m from the tester. Figure 5 shows a cable connected to a device at the far end, such as a television, CATV service, VCR, DVD player, satellite dish, splitter, or antenna. Dashes shown for length mean the tester cannot measure length because the device does not produce reflections. Conductive material stuck between pins at connector.